He was a Bronx kid. She grew up in Washington State. He was raised on pop music of the 1940s and ’50s. She had a fondness for traditional fiddle music and ’30s and ’40s popular tunes. He hung out in Greenwich Village coffeehouses and roamed North Carolina and Tennessee in search of traditional players. She played clubs and colleges on the West Coast and took a liking to the jazzy sound of the Swing Era. Since joining forces—both artistically and romantically (the two would marry in 1991)—Jay Ungar and Molly Mason have become one of the most celebrated duos on the American acoustic music scene. 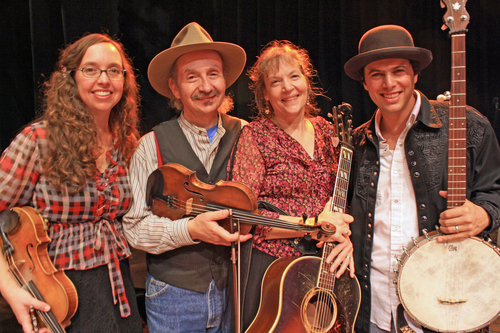 Jay Ungar & Molly Mason are masters of music and storytelling who generously share their lives and their music with audiences. There are so many moments and strands to savor in the course of an evening of their music. Jay’s fiddling is brimming with playfulness, drama, soulfulness and technical verve, as he explores the many musical styles and idioms that he has internalized and made his own. Molly’s total mastery and inventiveness on piano and guitar is always spot-on, as she supports the tunes and follows the flow of the melody. Her rich and expressive vocals along with the resonant strains of Jay’s violin reveal the deep emotions that flow in the duos veins. Millions were entranced by the music they did for Ken Burns’ PBS documentary The Civil War. Their performance of the series’ signature tune, Jay’s haunting composition, Ashokan Farewell, earned the couple international acclaim. The soundtrack won a Grammy and Ashokan Farewell was nominated for an Emmy. This simple, but powerful melody was originally inspired by the week-long Ashokan Music & Dance Camps that Jay & Molly run for adults and families at The Ashokan Center in the Catskill Mountains. People attend the camps to become better fiddlers, guitarists, mandolin players, percussionists, dancers, dance callers and instructors—and in doing so they become links in the chain that helps pass our folk heritage from the people who came before us, to those who will follow. Ruth Ungar Merenda is a singer songwriter who performs with many folk bands including The Mammals. She also plays fiddle, ukulele and guitar. She is the daughter of Jay Ungar. Mike Merenda is a singer-songwriter with the American folk band, the Mammals. He plays guitar, banjo, ukulele and percussion.